Central Working Committee meeting of AIPEU Group ‘C’ was held at Jhansi (Uttar Pradesh) on 23rd & 24th December 2018. The meeting commenced with the lightening of holy lamp by Coms. 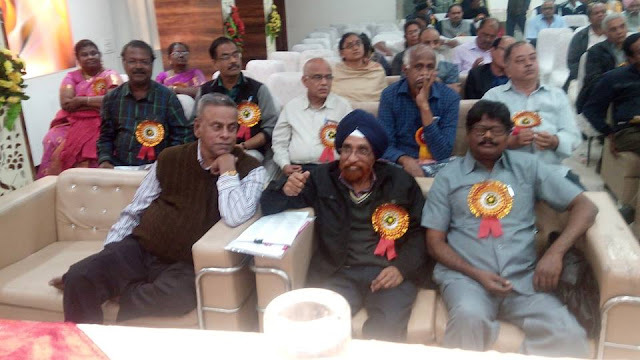 Giriraj Singh, President NFPE, K.V. 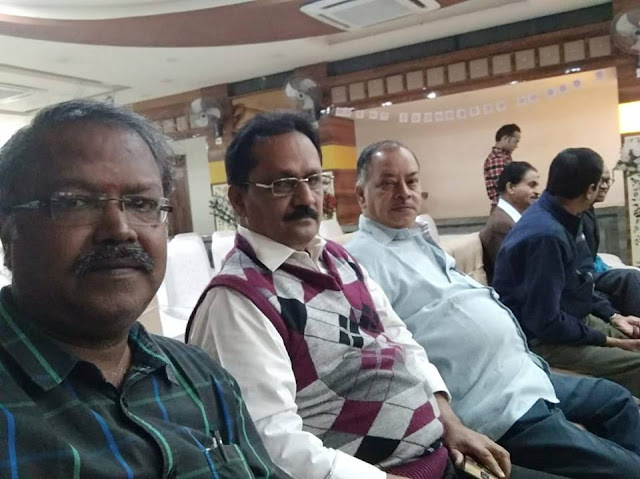 Sridharan, Ex-General Secretary-P3, J. Ramamurthy, President-P3, R. N. Parashar, Secretary General, NFPE & General Secretary P3, S. A. R. Mazgaonkar & G. Janakiram, both working President, P3. 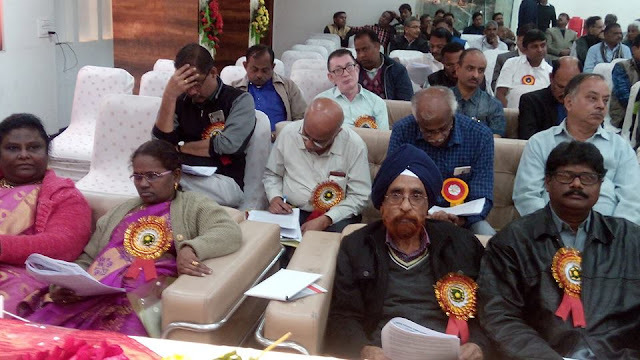 The meeting was presided over by Com. J. Ramamurthy, President R3. Reception Committee led by Coms. 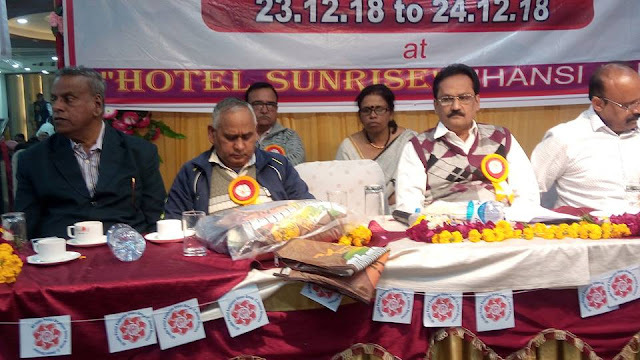 Ravindra Trivedi, Ex-Vice President, P3 Uttar Pradesh, S. M. Tripathi, Circle Secretary-P3 Uttar Pradesh, V. B. Pachauri, Circle President P3 Uttar Pradesh, H. H. Pandey, Divisional Secretary, P3 Jhansi, B. D. Gupta, President R3 Uttar Pradesh, honoured the guests, leaders, CWC members by garlanding and presenting shawls, mementos, badges etc. 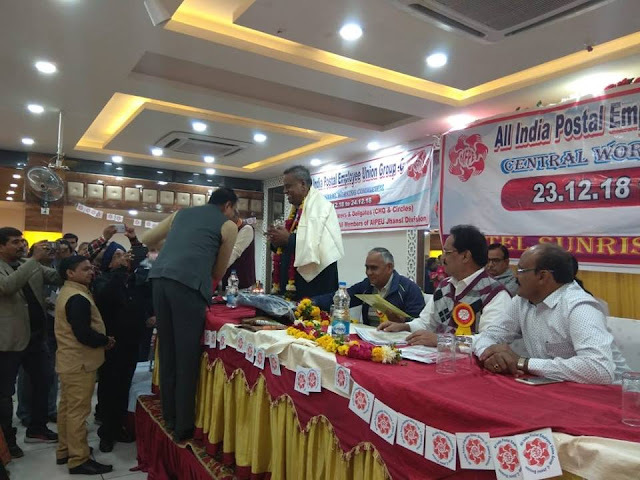 Before commencement of meeting, homage was paid to the eminent leaders in political, social and various other fields, trade union leaders, comrades, veteran soldiers and common man who lost their lives during various natural committees. Welcome speech was delivered by Com. 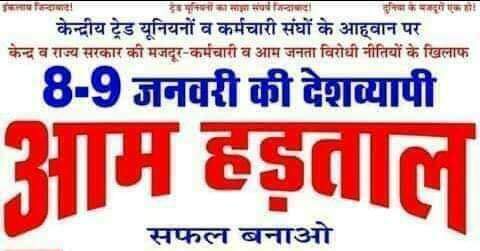 H. H. Pandey, Divisional Secretary P3, Jhansi Division (Uttar Pradesh). Com. President after checking the attendance declared the house as composed, as 14 CHQ office bearers out of 15 and 20 circle secretaries out of 23 were present. Com. President presented the agenda before house which was approved by the house, unanimously with slight addition. C.W.C. was inaugurated by Com. Giriraj Singh, President, NFPE & General Secretary R3, who elaborately spoken on the issues confronting postal employees in particular and common man in general. 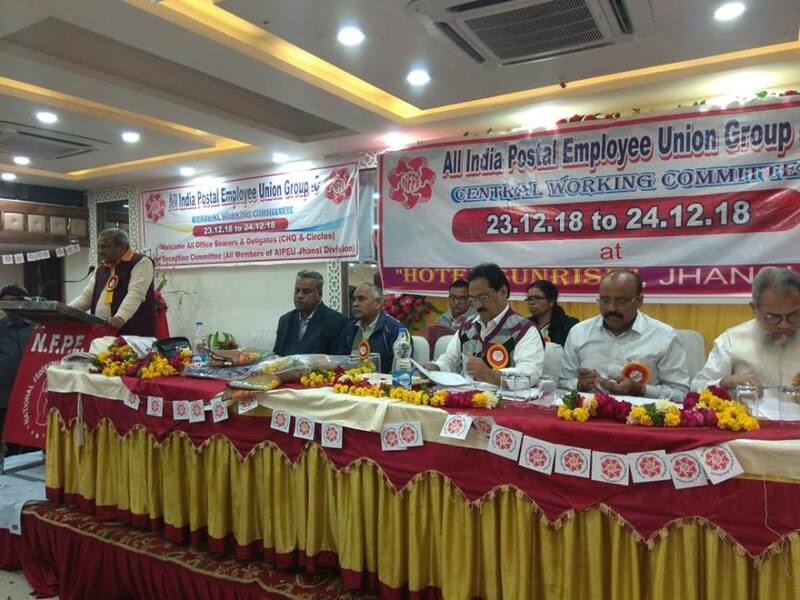 He stressed the need of 2 days Nationwide strike on 8th & 9th January 2019 along with all Central trade unions, independent federations, unions in organized and unorganized sector, farmers and agriculture workers and appealed to all to make the strike a grand success in Postal Department. He wished for the success of CWC and called upon to take decision on various issues which will guide NFPE, being the leading organization. 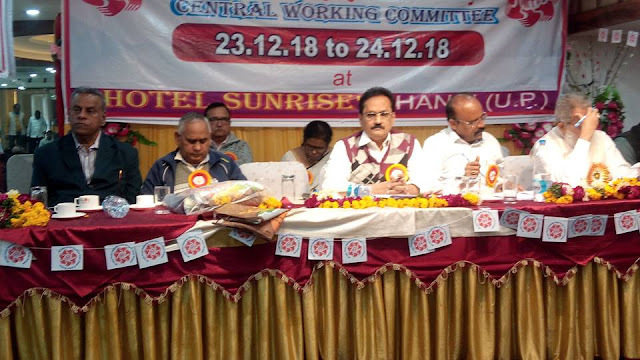 After that General Secretary was asked to initiate the discussion on agenda items General Secretary presented the work report during the period under review and presented action taken on all the issues and progress thereof. An elaborate discussion took place on the agenda. All Circle Secretaries presented their views and report on agenda items on behalf of their respective circles. All CHQ office bearers and Mahila Committee members also presented their views on agenda in general and women related issues in particular. Com. 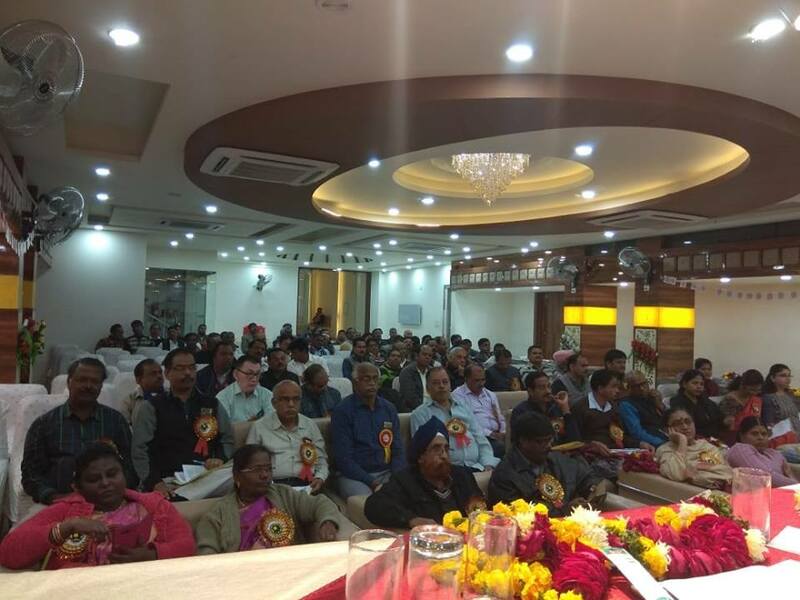 K. V. Sridharan delivered a very valuable speech focusing mainly on cadre Restructuring, P.M. Cadre, filling up of vacant posts and corporatization move of the Department. He gave some guidance for further improvement in functioning of CHQ. 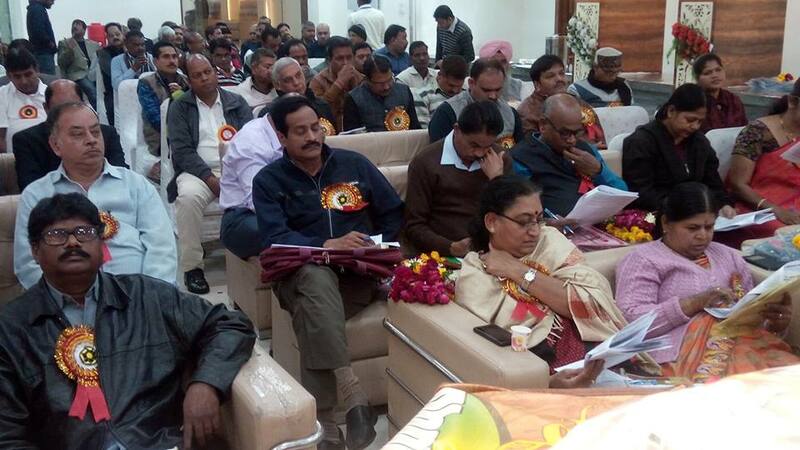 After all, General Secretary gave reply in brief to the queries and questions raised by CWC members. He told that whatever is possible during this period in which a totally pro-corporate and anti-worker Govt. is in power, he is trying his best to resist the onslaughts in the wake of policy offensives of present Central Govt. 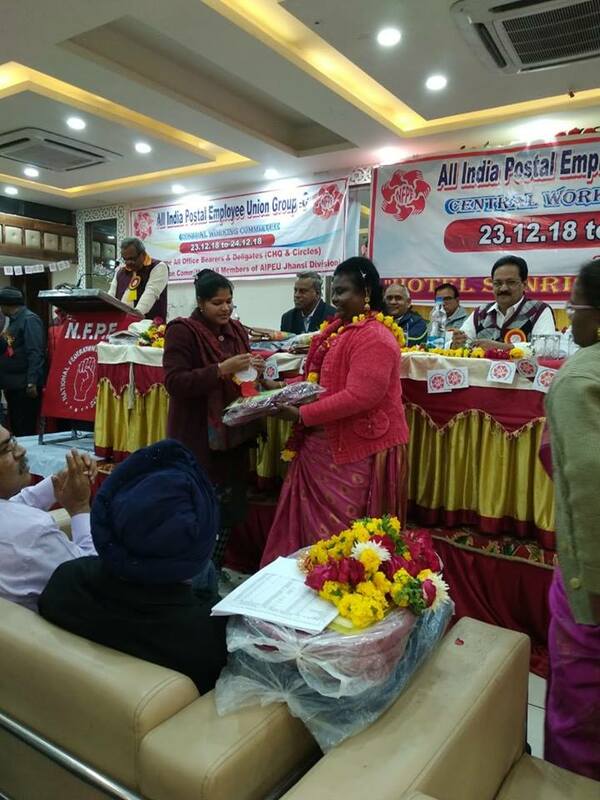 Though the mindset of bureaucracy of the Postal Department has also changed according the Central Govt., even than we are trying to get our genuine demands settled and stop any type of victimization. The discussion in the CWC was very healthy and fruitful. All CWC members presented their views frankly and fairly. Everybody assured CHQ to provide full co-operation in running the affairs. The following resolutions were also taken in the CWC, which will be published in detail elsewhere. 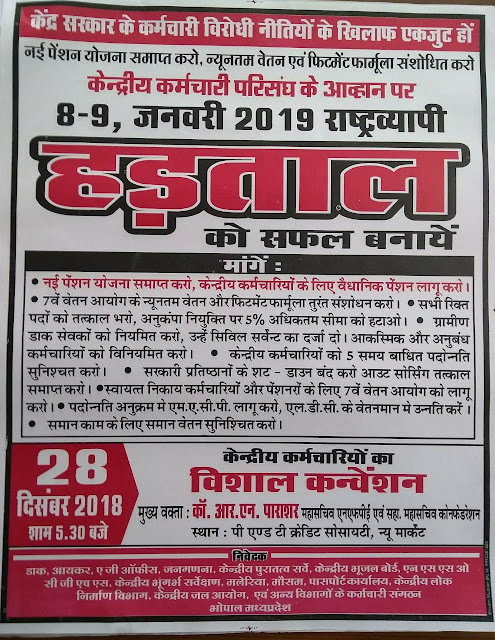 (1) To make the two days strike on 8th & 9th January 2019 – a grand success. (2) To put the Circle unions of Punjab & J & K in function, General Secretary was authorized to conduct the election. (3) For improvement of financial position, CHQ was authorized to take disciplinary action against defaulting branches. 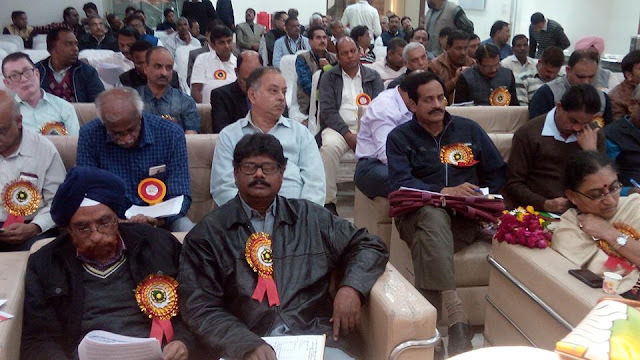 CWC ended in a very good environment Reception Committee of Jhansi (Uttar Pradesh) deserves all appreciations for making all arrangements of meeting, stay of leaders, food arrangement in a very excellent manner. Every member of CWC appreciated the efforts made by reception committee and conveyed heartiest greetings. 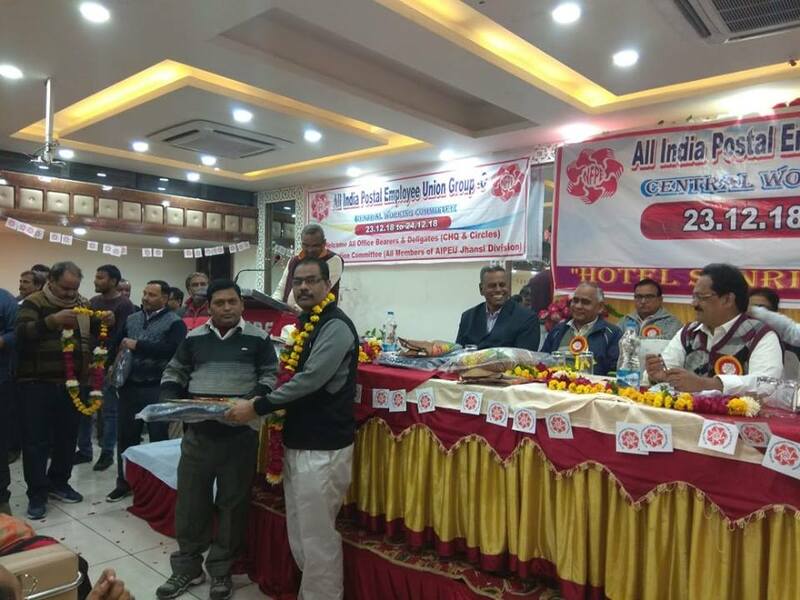 We also on behalf of P3 CHQ extend heartiest thanks and greetings to the Reception Committee of Jhansi and circle union of Uttar Pradesh Circle who organized the CWC at a very short notice and in such a splendid manner. Vote of thanks was offered by Com. Ravindra Trivedi, Ex-Vice President, Uttar Pradesh & Ex-Divisional Secretary, Jhansi. The CWC ended with shouting of slogans. 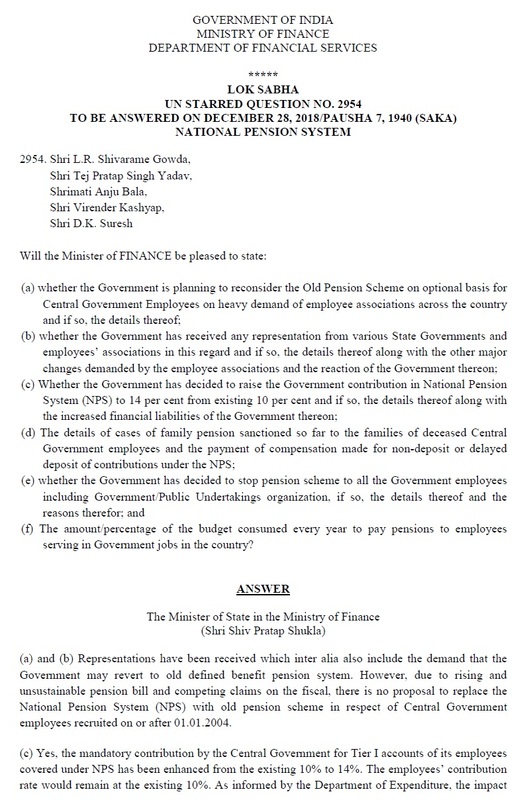 FOR INFORMATION TO ALL GENERAL SECRETARIES, CIRCLE, DIVISIONAL & BRANCH SECRETARIES OF NFPE & FNPO. THE CAMPAIGN PROGRAMME MEETING FOR NEW DELHI SCHEDULED TO BE HELD ON 4th JANUARY 2019, IS POSTPONED AND RESCHEDULED TO BE HELD ON 6th JANUARY 2019. ALL ARE REQUESTED TO NOTE AND ATTEND THE MEETING AT VARIOUS PLACES IN NEW DELHI. 3. This issues with the approval of Department of Expenditure vide their I.D. No.1 (3)/V-V/2018 dated 4.9.2018 and 1.D. 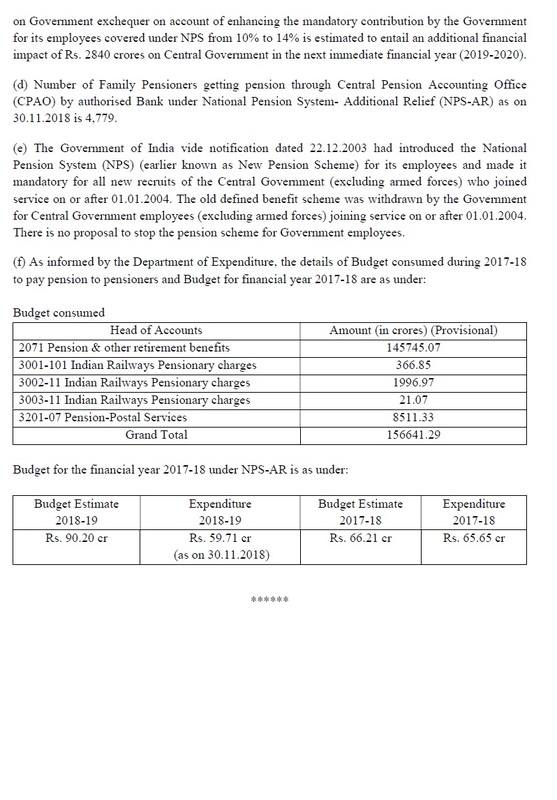 No.1(3)/V-V/2018 dated 28.11.2018. 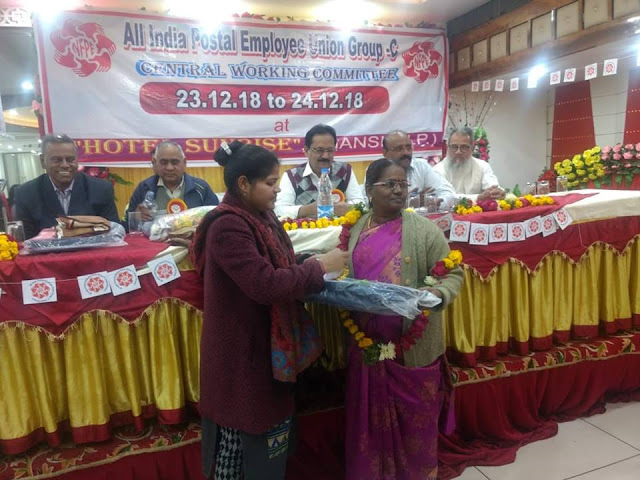 MERGER OF 33 POSTAL DISPENSARIES WITH CGHS – REG. The Central Working Committee Meeting of AIPEU Gr.C, CHQ is commenced today i.e. 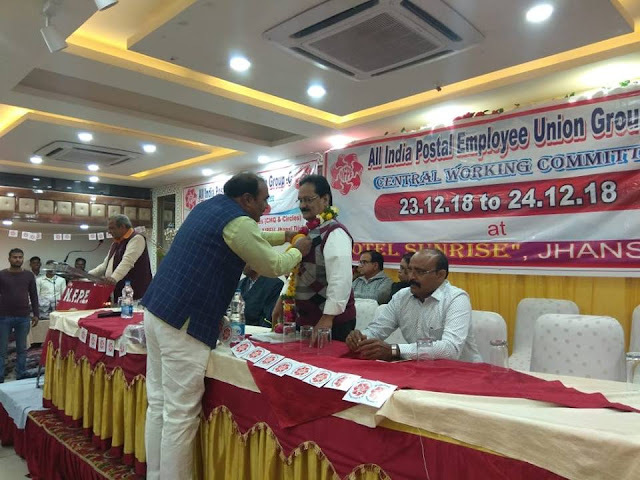 23.12.2018 at Jhansi - U.P under the Presidentship of Com. J. Ramamurthy, President, CHQ. Com.J. Ramamurthy, President, in his Presidential address has advocated exclusive strike for settlement of urging and long pending sectional issues as well as, against Corporate moves of the Dept like IPPB/Insurance Corporation etc. Com. 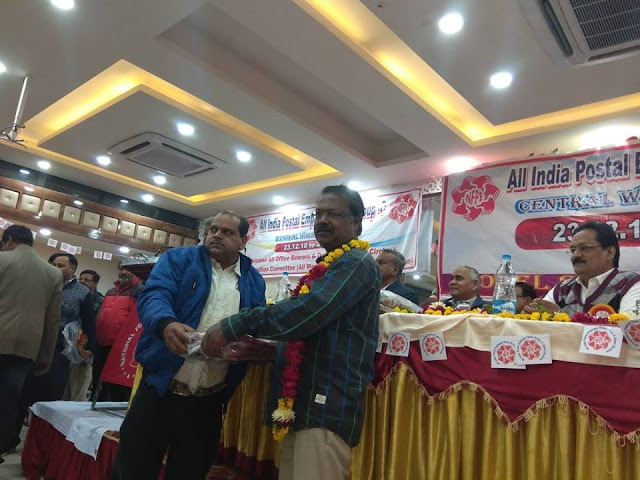 R.N Parashar, General Secretary has initiated the debate on issues, programmes conducted, settlements made, proposed strike on Jan 8th and 9th , 2019, and for any possible struggle purely for settlement sectional demands. Discussions were undertaken by various Circle Secretaries in the subject committee and most of them assured for 100% strike on Jan.8th and 9th, 2019, besides an exclusive strike for settlement of sectional issues, possibly either through PJCA or by NFPE or by P3 alone. 20 out of 23 Circles Secretaries and 13 out of 15 office bearers have attended and our senior Leader Com.KVS is also attending and guiding our CWC. Some of the photos taken during the CWC meeting are placed below for your view.